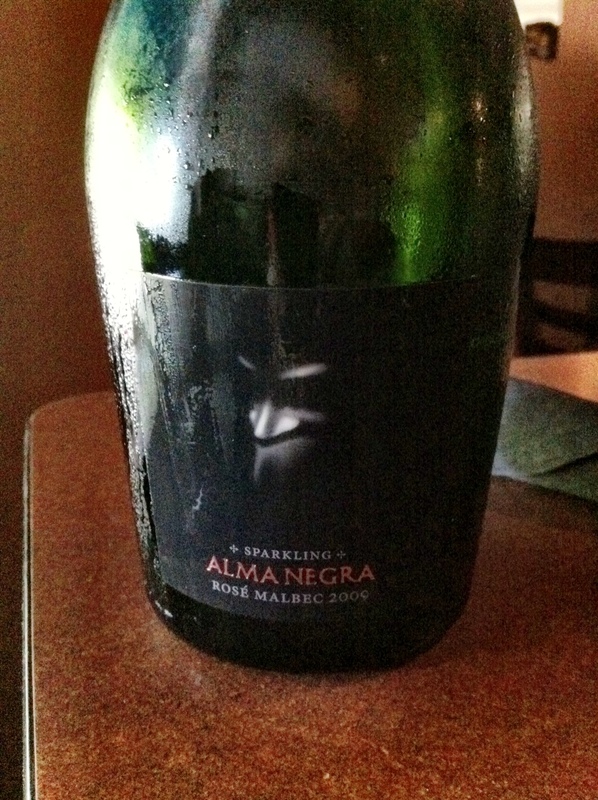 Alma Negra Sparkling Rose of Malbec, 09 Argentina | the wine snob. Okayokayokay. I promise this will be the last Rose post for a while. And for the record, this is a Rose sparkling, NOT strictly a Rose, so it’s a totally different category. The first step was admitting I have a problem. But honestly, I chose today’s wine based on what I feel like sipping on right now. And it happens to be slightly pink in color. Can you blame me? It’s noon on Monday afternoon. I’m chilling at Cellar listening to Fleet Foxes on Pandora. And doing a little bit of work, too, I guess. It’s truly a perfect storm of Rose necessity. Okay, so I lied a wee bit. I didn’t just pick this wine for today because I felt like drinking it, I also picked it because it’s awesome and different! And I just found out it got 89 points from Stephen Tanzer’s International Wine Cellar. So that’s cool, too. And check out the spooky dude on the bottle! He must be the one with the black soul (alma negra = black soul). Yikes! Cute, lively notes of sweet tarts and candied strawberries are a-plenty. Light and fresh, with additional aromas of rhubarb, raspberries and fresh biscuits. Sort of reminiscent of a summertime strawberry shortcake. But one of those semi-sweet, crunchy shortcake biscuits, not a sticky sweet fluffy one. I like those. Light on its loafers, but offering a lengthy and elegant finish. 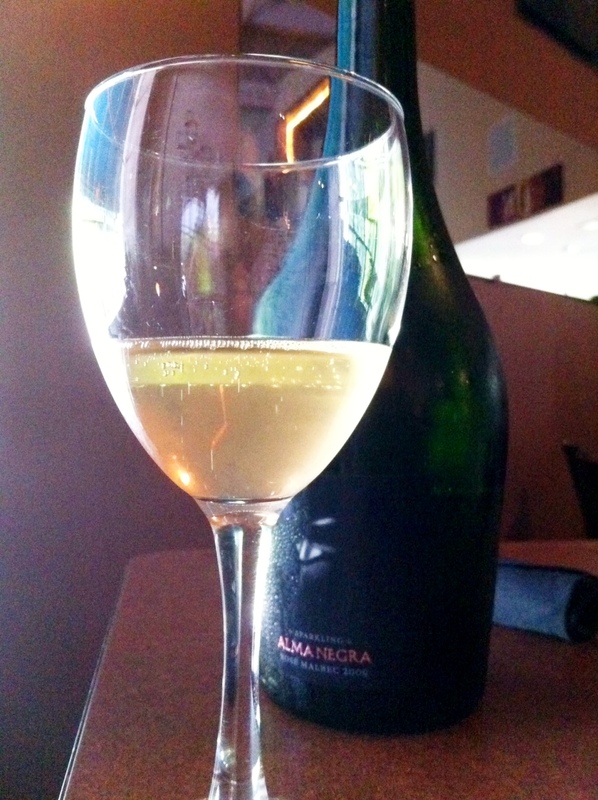 We sold the bejeezus out of this wine last Tuesday night during Champagne Tuesday! And we likely will again tomorrow night. What? you haven’t been to Champagne Tuesday? I find this hard to believe, first of all- but you need to get in on the action because every Tuesday night at Cellar we pour glasses of champage, cava, prosecco, and anything else that sparkles for half-off! Flocks of females flood Cellar with a burning desire for frothy bubbles. Did you like that alliteration? I thought it was fun. 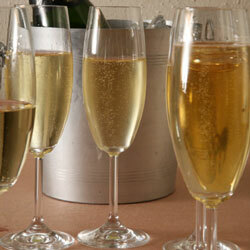 I really don’t know why I’m plugging Champagne Tuesday on here, because it stays busy with little to no help from moi. BUT it is a perfect opportunity for you to try THIS WINE for $4 a glass! Then you can whisk away a bottle to take home for $18. It’ll be a good start to your week, and a good way to celebrate that we FINALLY made it to August, which means there’s only two more months of summer to go. Yes, September counts as summer. It’s still hot.